Commercial drivers used to calculate the number of hours traveled and miles traveled on paper to determine the hours spent on service to ensure they were within HOS compliance. They would be required to manually make the calculations and any violations would not be realized until after it had already occurred. Then electronic logging devices (ELD) were created. ELD devices are attached directly to the engine of a commercial motor vehicle. The hardware monitors and records driving hours by measuring when the engine is running, when the vehicle is in motion and the distance traveled. This monitoring device makes it easier for organizations and drivers to comply with the HOS rules, which are in place to ensure the safety of the drivers and all motorists on the road. Drivers no longer have to worry about tracking their driving time on their own. The system tells them when they are nearing their daily or weekly allotment. If you’re looking for an ELD device for your fleet, how do you know which device is right for you? 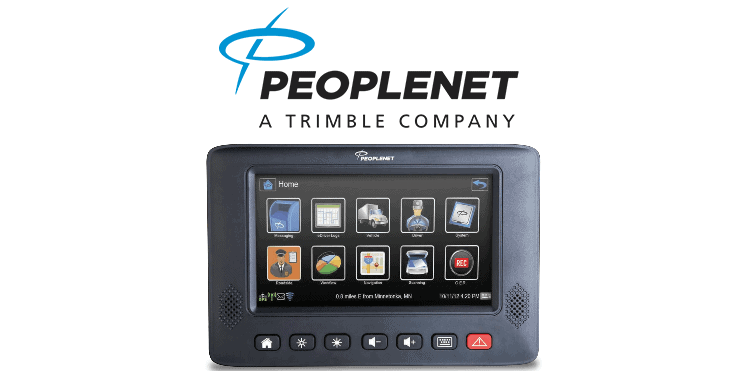 One of the premier ELD devices on the market is the PeopleNet Display.4. While there are several advantages to carrying this device, it also comes with a few drawbacks. We’re breaking it down for you, so you can make an informed decision on what device is best for your fleet. PeopleNet was one of the first trucking technology and communications companies to offer an electronic logging device back in 1994. They’ve spent the past 15 years honing their technology to develop a premium product, which is why they are one of the best electronic logging devices on the market. Reliability, durability and functionality are the key differentiators from other ELDs, along with an array of features you simply cannot find anywhere else. There are several key features that come standard on the PeopleNet Display.4. A few of these features include: tire pressure monitoring, fuel consumption reports, real-time safety alerts like speeding, fault codes and engine status monitoring. There are more advanced features available for this device that include integrated multi-directional cameras and advanced navigation. In fact, this device offers locating and messaging to help keep track of the fleet, predict arrival times and more. The standard workflow integration communicates throughout the delivery process, from pick-up to drop-off, to deliver more efficient reporting times. In turn, this improves your customer service capabilities and drives revenue for your fleet. Speaking of advanced functionality, the software can track driver performance to maximize MPG and reduce operating costs to ensure efficient operation. Drivers have the ability to control their routes using in-cab navigation and avoid excessive fuel and equipment expenses by staying on the correct route. Despite the large number of advanced features it carries, the PeopleNet Display.4 still functions at a high processing level, without significant lags or system shortages. Aside from the wide variety of top-notch features, this device is also easy to use and navigate for the drivers. The interface is simple and allows any driver to accurately monitor and control the device to recognize when they are reaching their hourly limits. And one of the most comprehensive devices comes with one of the most advanced networks. The PeopleNet ELD offers the best 4G LTE cellular communication, allowing enhanced performance no matter where the truck is in the country. This means drivers and offices have immediate access to the information regardless of whether they are experiencing network connectivity issues. This device even has a messaging platform, where drivers can communicate directly with the back office. When matched up to the competitors, the PeopleNet Display.4 offers the most reliability, durability, features and connectivity. Another benefit of this device is the reporting it offers to drivers and fleet offices. At any moment, drivers and managers have a wealth of information directly at their fingertips. They can see how many hours each driver has logged, if they are nearing their limit or if they are in violation of any HOS rules. This helps maintain the operation of each fleet, ensuring that they don’t disobey any laws. Allows tracking for miles traveled, off duty, total on-duty, available driving and more. The biggest drawback for the PeopleNet Display.4 is the hefty price. This device comes with one of the highest installation and hardware costs. The initial price is around $1,200 per vehicle followed by a $43 per month price tag to cover the service plan. With the big price tag comes a lengthy installation process. This might be enough to scare off some potential fleets, but there may be some cases where the initial setup costs are worth it. While many businesses cannot justify the large initial cost, if you have a large fleet it is worth the price for the functionality. In fact, the device is designed to be completely customizable to fit your needs. PeopleNet truly offers one of the best products on the market when it comes to ELDs. However, each individual fleet should consider the cost and whether they’re willing to fork over the big bucks. You’re looking at an upfront cost of $1,200 plus a monthly fee of $43, making the PeopleNet one of the most expensive ELDs out there. So your large fleet can configure the system to meet your exact needs, saving you time, money and resources. This is one of the key differences between PeopleNet’s device and other ELD devices available. To provide a quick summary, here are the main pros and cons when considering the PeopleNet ELD for your fleet. When purchasing an ELD device, it’s important to take everything into account. If you have a large fleet, the high upfront cost may be worth it for the advanced features and customization this device offers. Over time, it may actually save you money by saving the time and resources previously put into ensuring accurate HOS reporting. PeopleNet continues to innovate and improve on their offerings – introducing eDriver Logs on their Android platform. This technology allows the data and displays to be stored in the cloud, where all drivers and fleet managers can access the information at any time. The Android platform also has the flexibility to connect to many phones and tablets, for a seamless experience for each driver. This fully connected platform enables full mobility, ease of use and unmatched connectivity. This enhanced network connectivity and cloud storage make PeopleNet eld devices are among the best available devices. Specially, for fleet managers and drivers. 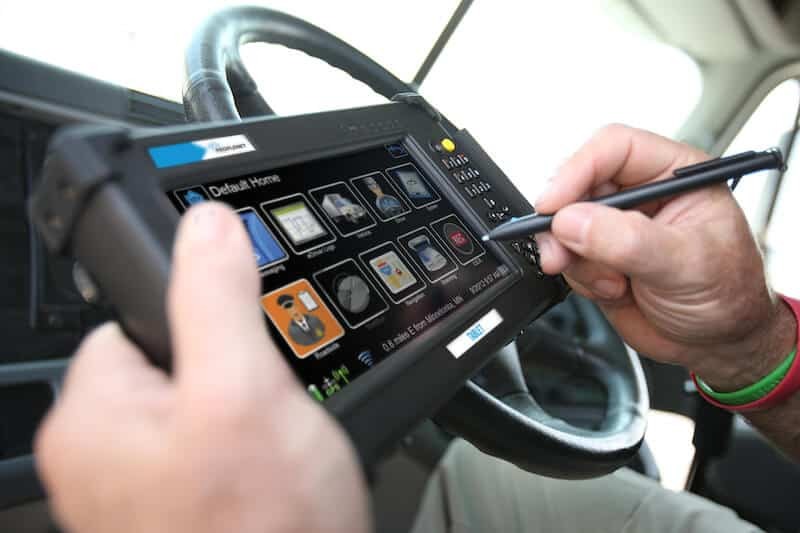 While the device may be pricey, you are getting one of the most reliable, advanced-featured ELDs you could possibly buy. Backed by a great support and great company, PeopleNet offers a familiar interface and a platform that is easy to use and navigate for all drivers. With some top standard features including engine monitoring, fuel consumption monitoring and safety measures; and more advanced features like cameras and navigation, the PeopleNet is one of the best options for fleet managers to effectively track and manage their fleet of drivers. Over time, this device could save money by keeping drivers on the correct route, receive real-time diagnostics and receive data on driver performance and behavior. This allows fleet managers to correct any problems or offer solutions before it has a significant impact on business. The real-time tracking also allows organizations to more accurately predict pick-up and drop-off times, improving customer service. With PeopleNet, you get the support of a company that was one of the first to introduce ELDs back in the early ‘90s, before ELDs were even well-known in the industry. The PeopleNet is a results of years of evolution and fine-tuning, so your fleet can have access to the most recent technologies and the highest functioning platforms to manage your drivers. While it certainly makes sense to shop around, the PeopleNet ELD is widely used, easy to navigate and has the most advanced features of any ELD on the market. These features justify the high price tag that comes with the device. You’re paying for peace of mind – so you don’t have to worry about connectivity issues or driver confusion. And if you do have issues, the PeopleNet support team is ready to field your questions.